Portrait Special from PHOTOGENIC of Dalkey - a Studio Session & Framed Wall Portrait. This Christmas, why not treat yourself or someone you love to a beautiful, professional portrait from one of Ireland’s best-known photographic studios for only €125. 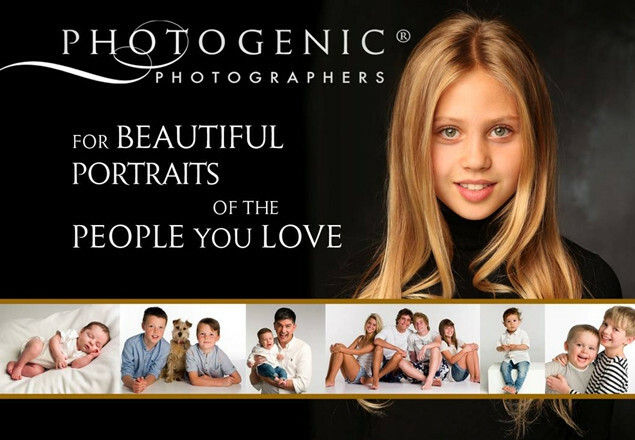 PHOTOGENIC can present you with the best photographs you have ever seen of your family, as unique framed portraits that will look stunning in your home. Renowned for their caring manner with families & children, Barry & Margaret Moore of PHOTOGENIC® create timeless portraits that reflect the age and stage of your family. The studio is located in a beautifully appointed & family friendly ground floor studio in Dalkey (opposite the Dart station), has ample on street parking and is wheelchair friendly throughout. Barry & Margaret have been capturing Irish families in their own distinctive, award-winning style since 1991, and will be celebrating 20 years in Dalkey in 2019. They are offering truly exceptional value for their 2018 Christmas Rewarding Times offer. You can treat yourself, or someone you love, to one of their beautiful, custom made wall pieces. This Portrait Special includes a studio session with either Barry or Margaret, and a Custom Small Wall Portrait, framed in your choice between two beautiful frame styles. Your finished wall portrait will be carefully crafted, including exquisite printing of your portrait along with high quality custom framing. You will have a portrait of real value which you will enjoy now - and forever. The offer is valid for sessions at our Dalkey studio from Thursday, January 3rd 2019 until Saturday, 30th March 2019 inclusive, during our opening hours. Your session must be booked by 2nd March 2019. Vouchers redeemed after the promotion ends will be honoured at face value & subject to an additional purchase. Please ask for details. Strictly one voucher per family/session. The offer is for one family unit – parents and child/sibling children, or a couple or individual of any age. This offer can be upgraded to a family of three generations for an additional €50 fee, paid when booking your session. Advance booking is required & subject to availability - please book early if you require a Saturday. PHOTOGENIC® has a cancellation policy which is detailed on the Prepare Well page of our website. Not valid in conjunction with any other offer, charitable fundraiser or promotion.